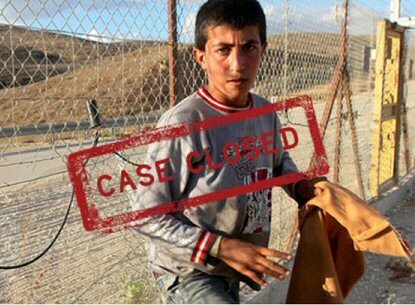 An Israeli rights group released, on Tuesday, a video showing Israeli soldiers intentionally targeting child who posed them no danger.In March of 2014, Israeli soldiers shot and killed Yusef al-Shawamreh, a 14-year-old Palestinian boy, as he went through a gap in the illegal Israeli Apartheid Wall, in the area of the village of Deir Al-‘Asal Al-Foqa, southwest of Al-Khalil. According to Days of Palestine, the boy had been to the area to pick edible plants from his family’s land, on the other side of the wall, in order to help provide for his family. In July of 2014, roughly four months after the killing took place, then-Military Advocate for Operational Matters Lieutenant Colonel Ronen Hirsch notified B’Tselem that the Military Advocate General (MAG) had decided to close the investigation. In the letter, Hirsch wrote that four soldiers, who had mounted an ambush, spotted three Palestinians sabotaging and crossing the Separation Barrier. The soldiers then carried out suspect apprehension procedure, ending with one soldier shooting at the lower part of Al-Shawamreh’s leg. However, according to Hirsch, the shot mistakenly hit Al-Shawamreh in the waist, killing him. B’Tselem said it requested a copy of the investigation file and was sent a partial copy only, including video footage taken by a military surveillance camera. While the information in the file revealed errors in B’Tselem’s initial inquiry, it corroborated its conclusions and highlighted the particularly appalling aspects of the incident. According to the file, on March 19, 2014, three Palestinians, an 18-year-old and two minors, went up to several gaps in the Separation Barrier that had long been used by Palestinian teenagers to cross through and pick edible Gundelia plants from their families’ land on the other side. The military had sealed the gaps in the fence the previous evening, and the ambush soldiers reinforced the seal with metal wire and plastic handcuffs, upon its arrival at the area. When the three teenagers found the gaps closed, they removed the wires from one of them, crossing the fence and the adjacent buffer zone. Only then, two of the soldiers revealed themselves. They called out to the boys to stop, fired two warning shots in the air and, then, fatally shot 14-year-old Al-Shawamreh. B’Tselem’s examination of the MPIU file found that the military’s investigation was sloppy and partial. No apparent attempt was made to reconcile the contradicting versions given by suspects and witnesses, and the responsibility of the commanders who decided to mount an armed ambush at the spot was utterly ignored, according to the group.